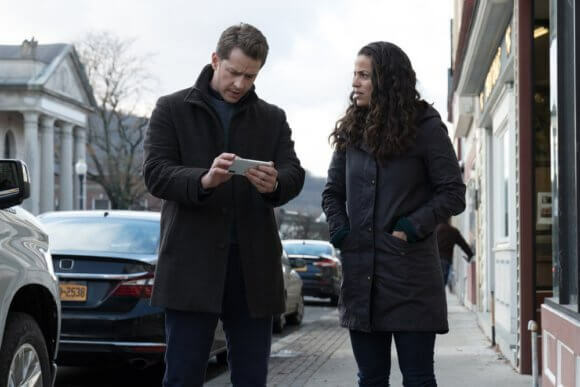 Manifest Season 1 Episode 12 Recap: "Vanishing Point"
“That’s us…now,” says Ben (Josh Dallas) to Michaela (Melissa Roxburgh) and Grace (Athena Karkanis) as they observe a drawing Cal (Jack Messina) made that might help them find him in season one episode 12 of NBC’s new mystery thriller, Manifest. As the episode begins, Ben races over to his house and is upset and concerned when he finds police cars in front of the house. “No, no! I told you no police,” says Ben to himself, realizing Grace must have called the police about Cal’s disappearance. Ben hurries into the house where the lead detective is asking Grace if she’s aware of any reason Cal may have run off. The detective begins interrogating Ben, asking him where he was when Cal went missing. Both Ben and Grace are offended by the tone and line of questioning from the detective. Meanwhile, Michaela is busy questioning Autumn (Shirley Rumierk) about Cal. Michaela informs her she knows she’s the mole and that she took Cal. Autumn swears she doesn’t know what she’s talking about. Just then Michaela receives a call from Olive (Luna Blaise) that the police think Ben’s behind Cal’s disappearance and that Michaela needs to come to the house right away. Michaela grabs Autumn and cuffs her, taking her into custody. Somewhere in a military action room, an officer tells Jansen (Brandon Schraml) they have eyes and ears on the house and are monitoring all the police activity. Michaela arrives at Ben’s house, leaving Autumn handcuffed in the car. She and Ben take Grace to Cal’s room and quickly bring her up to speed about the callings and how Cal may be the target of this mysterious Major. Ben tells Grace they need to get rid of the police because the Major can monitor them. Ben, Michaela, and Grace look through Cal’s drawings and find what they think might be a map that’ll help find him. They notice one page has been torn out. Grace recognizes one drawing of a small town they visited a while back, so she and Ben decide to check it out. Olive wants to help but Ben says she’s home base and for her to stay by a phone. Michaela continues her questioning of Autumn in an interrogation room at the police station. Back at the military meeting, Jansen’s informed Ben and Grace left but didn’t take their cars. Jansen wants them to keep looking for Cal’s parents and to call the Major with updates. Michaela’s interrogation of Autumn finally forces the woman to admit that even if she knew where Cal was, she could never tell. She claims it’s not just her life in danger. Michaela realizes the Major has threatened Autumn with the life of someone she cares about. Michaela does some digging and discovers Autumn has a daughter. She returns to confront Autumn with her discovery, and by the look on Autumn’s face Michaela know she’s hit a nerve. “You traded a child for a child,” says Michaela, confronting Autumn. She then assures Autumn she still has time to do the right thing. Back at the military meeting, Jansen’s informed that Autumn was taken into police custody. He calls the Major so she can pull a few strings and have Autumn released. Ben and Grace’s ridiculous fight is interrupted by Olive who sends them a text that she thinks she knows where Cal is. It’s a place only Olive and Cal know about, somewhere they used to go. At the police station, Michaela pleads with Autumn to do the right thing and help her find Cal. Autumn admits she told the Major about Cal but she didn’t give him to her. Michaela asks her for the missing drawing but Autumn clams up. While Ben and Grace are driving to where they suspect Cal’s been taken, Ben realizes they’re being followed. He leaves the road and drives down dirt roads through the woods and the black SUV mirrors his moves. Autumn’s released and calls Jansen, telling him she knows where Cal’s located. Jansen calls off the SUV that’s following Ben and Grace and it races off in another direction. The SUV pulls up to an old cabin and the agents burst in and discover it’s empty. Autumn lied to help Michaela. Autumn gives Michaela the drawing and it’s of her and her daughter. Autumn tells Michaela she never told Cal about her daughter but somehow he knew. Michaela shocks Autumn by informing her she knows where she can find her daughter and wishes her luck. Michaela turns over the drawing and on the other side there’s a drawing of a cabin in the woods. She texts Ben and Grace a photo of the drawing and tells Ben not to go inside until she gets there. Immediately afterward she experiences a calling and sees snow falling. Ben and Grace drive to a fork in the road and are unsure which way to go. Ben realizes that one of Cal’s drawings is really a note telling them to turn left. They drive a little further and find the cabin in the woods. Not willing to wait for Michaela, Ben and Grace bust in and find Cal sitting on the floor cold but otherwise okay. Cal confesses he had to come to help someone. He adds that the person he’s supposed to help is almost there. A man does in fact show up at the door and Ben grabs a poker to defend them. Cal doesn’t want his dad to hurt the stranger who barges in and collapses. Cal tells Ben it’s okay and that he needs their help. Ben realizes Cal had a calling. The man passes out and Ben and Grace change him out of his cold, wet clothes. Cal brought a sleeping bag and bandages to treat his wounds. A little later Grace apologizes to Ben, realizing now what it’s like dealing with the calling and having a better understanding of what he’s been going through. Grace asks him from now on to always tell her everything and not to keep secrets. She believes they’ll deal with whatever is happening together. Jansen calls the Major and informs her Autumn gave them a phony lead. The Major (Elizabeth Marvel, finally appearing on screen) tells him not to worry. When he asks about whether to continue looking for Cal, she tells him that eventually the Stones will return to their home. The Major gets off the phone and tells a realtor agent she’ll take the apartment that looks out over New York City. Back at the cabin, the stranger tells Ben and Michaela his name is Zeke (Matt Long) and that he was hiking when he became engulfed by a blizzard. He found a cave and burned pages of a magazine to keep warm. The last page had a photo of Michaela and a story about her going missing on Flight 828. Zeke tells them he felt as though Michaela was willing him to live and so he left the cave and kept going, saying he must find her and constantly seeing her face. Zeke doesn’t understand how they’re alive because he knows they died on the plane. Michaela and Ben explain they came back and wonder why he didn’t see their return on the news. Ben asks him how long he was hiking and Zeke reveals it was two weeks. Ben takes the magazine page from him and looks at the date…it says 2017. Ben shows it to Michaela and they tell Zeke he lost a year. It’s now 2018.